It's not exactly the most unexpected of new models, but Porsche has finally fitted a diesel to its four-door Panamera super saloon. The engine is a 3.0-litre V6 that's also used in the Cayenne and develops 250bhp along with an impressive 550Nm of torque, which guarantees effortless performance and will be ideal for motorway cruising. The new model goes on sale in August 2011 priced at £62,134, putting it right up against other four-door luxury diesel saloons like the Jaguar XJ and Audi A8. And it competes well in terms of performance with a 0-62mph time of 6.8 seconds and a top speed of 150mph. But the key figures are economy and here it shines with a claimed average of 43.5mpg and CO2 emissions of 172g/km. Choose the optional lower rolling resistance tyres and this improves further to 44.8mpg - better than all its rivals in this class. 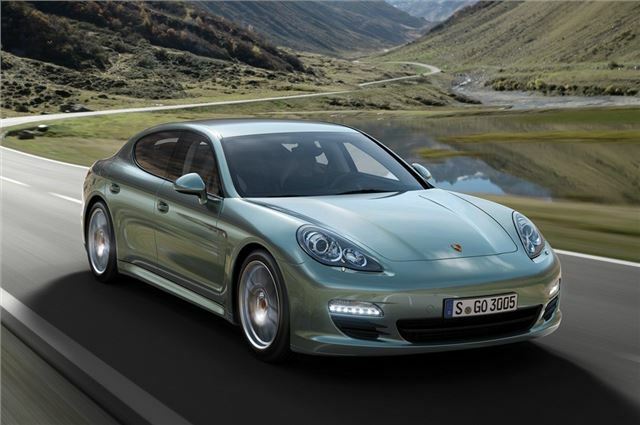 Every Panamera, including the new Diesel model, has a high level of standard specification that includes leather interior, Porsche Active Suspension Management (PASM), xenon headlights, front and rear ParkAssist, tyre pressure monitoring, automatic dimming rear view mirrors, Porsche Communication Management with touch-screen satellite navigation and audio controls, cruise control and a three year warranty.